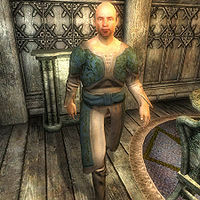 Tove the Unrestful is a Nord commoner living in Bliss, New Sheoth. He seeks your help in finding calipers and tongs to build a skyboat with. Tove seems to have trouble understanding the laws of the physical world, along with the concept of time, or maybe he understands it better than anyone. Tove is true to his name, having a very busy lifestyle. He spends very little time sleeping, only taking a quick four hour nap at 2am in his upstairs bedroom, making sure to lock his upstairs door to prevent any unexpected guests. At 6am he rises, going through the door connecting his house and Books of Bliss to visit his flirtatious neighbor, Sontaire, for two hours, sometimes eating if he has any food on him. At 8am he returns to his house, unlocking the door to allow visitors access. At midday he goes to The Choosy Beggar for two hours of socializing, again only eating if he has food in his inventory. As long as neither The Cold Flame of Agnon or Ritual of Accession is running, he will go to the Sacellum Arden-Sul at 4pm for two hours of worship. When he returns home he enjoys a two hour dinner on the bottom floor of his house. He spends all his spare time working on his boat, either hammering at it with his axe or examining it. He wears a brown tunic, brown trousers and a pair of brown loafers. He is armed with an iron war axe, Sontaire's key, his key and some gold. People around New Sheoth are often discussing the workaholic Nord: "I heard Tove the Unrestful is building something again." and "Tove the Unrestful in Bliss is collecting items to build something." Others will say the same, but quite patronizing: "Tove the Unrestful in Bliss is collecting useless items to build something." Others will explain about the 5 gold award: "I heard he will buy calipers and tongs from people he likes. ", "I hear he'll buy calipers and tongs from people he trusts." and "If you've got calipers or tongs, he'll buy them from you. Well, assuming he likes you." Finally, Hale's resident poet Halion, has dedicated two rhymes to Tove: "Of Tove in Bliss I tell you this, there's something that she [sic] desires. She builds and builds and builds all night until her weary bones retire." and "It's said he seeks nothing but calipers and tongs and builds all night whilst he sings silly songs." Meanwhile, in Split, the demented Atrabhi will mischievously tell you: "Tove the Unrestful, in Bliss, is definitely NOT collecting items to build something. He couldn't build a rock with a stone." and "If you've got calipers or tongs, he'll steal them from you. He certainly won't buy them." Tove busy building a Skyboat with an axe. If you visit The Choosy Beggar during lunch hours at noon, you may notice the balding Nord saying oddities to the other regulars; "I've just discovered that water is actually heavier than air. Who would have thought? ", "Busy day today, isn't it?" and even "A caliper a day makes the skyboat... wait, that doesn't rhyme." When you talk to him, it becomes quite clear that Tove is stuck in a different time zone as anyone else, as he will just ask: "Do you have any yet?" While confusing, you are presented with two options; either play along or ask him what he is talking about. The latter 'Uh…no, not yet' will make have him remind you of an agreement you made with him in the future: "We had an agreement, don't you remember? I'm trying to build a skyboat and you are supposed to bring me calipers and tongs. It all happened tomorrow. I'm sure this conversation will all come back to you in a day or two." Choosing the former option will make him apologize for very odd reasons: "Sorry. I keep forgetting that most people don't remember when we'll meet in the future. Wait, this is yesterday's future. I'm the one that's confused. Anyway, you're going to help me find calipers and tongs. No point in denying it. You've already agreed tomorrow." When asked about the Calipers and Tongs, he will explain a thing or two about his current project and the challenges of gravity: "I'm using them to build my skyboat. Just between you and me, the hardest part has been getting the water to not fall out of the air." On the Skyboat, he will tell you about his project, turning the worn-out old boat in his house into a Skyboat: "A marvelous contraption. I've gotten it to float in water perfectly. Now if I can just get the water to fly through the air. That's what the calipers and tongs are for. I need them to keep the water airborne." When you leave him he will greet you farewell with the words: "Back to work I go." or "I'll talk to you some more yesterday." When you approach him again, he will share some good news: "My boat is coming along swimmingly." If you choose the topic 'Calipers and Tongs' without any in your inventory, Tove will be quite disappointed with the world: "None? The world is devoid of calipers and tongs? What a sad state of affairs." If, however, you have his desired items in your inventory, he will offer to take them off your hands right away, 5 gold a piece: "I see you found some. Frankly, I could use all of them. Are you willing to sell them? Five gold each, just like I told you next week." If you refuse to sell them, he will say: "You don't want to sell them? I'll have to get you to sign a no competition writ a few days ago. Can't have you building your own skyboat." If you accept, he will apologize for not giving you the gold sooner: "Excellent. Here's your money. I should have paid you last week. I'm dreadfully sorry about the delay." Unfortunately, working for someone living a week ahead of everybody else has its disadvantages; after you delivered 100 items to Tove, thus completing the quest, he will have moved on to bigger projects, and will basically tell you that your hard work was in vain; "Calipers? Tongs? What would I need those for? Oh! You must be thinking about the skyboat. Yesterday's news. I'm working on a collapsible fork now. I just have to tear apart the boat to get to the hinges." If you approach Tove after completing his quest, he may greet you with his initial introduction: "Hello, my name is Tove. "The Unrestful," they call me. So much to do, and so little time. There's only one of me to go around, you know!" and, on subsequent meetings, say: "Hello there. You don't have any experience building boats, do you? I'm rather stuck, what without any instructions and all. Confusing stuff." If you meet Tove after completing the Main Quest, he will respectfully let you know that he noticed you: "My Lord! To what do I owe the honor?" When approached before the quest, he will be a bit more humble, but still ask: "Lord Sheogorath! Have you found any yet?" and will then proceed to task you with the Calipers. Upon exiting conversation, he will bid his Lord farewell with the words: "I return to work, Lord. Farewell." Once you have completed the quest, he will greet you with some impatience: "I am quite busy, but there is always time for you, Lord Sheogorath. What may I do for you?" I heard there's a new adventurer trying to get into the Shivering Isles. No real matter to me, unless he can build a boat. Heard the Gatekeeper was killed. Waste of a creature that size anyway, if you ask me. I heard the Resonator of Judgment is working again. Can't say that it affects me much, so I'll just go about my business. Thadon seems upbeat again. I know how hard it is to get anything done when you're not feeling up to it. I've no time for conspiracies. Get in the way, they do. Glad I wasn't involved at all. Too much to do. No time to talk about the Great Torch being relighted. Even if you don't agree with the method, you have to respect the hard work it takes to replace a Duchess. Even if you don't agree with the method, you have to respect the hard work it takes to replace a Duke. The Fringe has been destroyed. Who knows what could happen next? I'll have to work quickly to get my affairs in order. They can build a new Gatekeeper, but I can't manage to get anything done. I'm over-tasked, I tell you. Perhaps now that our guards are restored, things will quiet down and I'll actually be able to get something done. Maybe it's not worth doing any more work. I mean, it certainly seems like we're all doomed. What's the point? Finally, all this mess is sorted out. I can get back to my work. Oh, I've lost so much time. Tove is supposed to always eat when at Books of Bliss and the Choosy Beggar. However, he usually has no food in his inventory. This is because the upstairs of Books of Bliss is owned directly by Sontaire instead of the relevant faction and because Tove isn't a member of the Choosy Beggar faction, which means picking up some food at either place would be stealing. Tove was originally intended to be female; while all rumor bits about him (with the exception of Halion's rhyme) were re-recorded, the subtitles still refer to him as female.